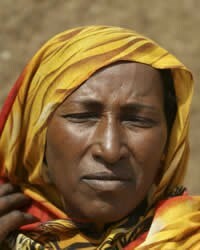 Overview: The Beja are one of the major ethnic groups of Sudan, Eritrea, and western Ethiopia. Savage wars in the 1970s and 1980s drove most of the Eritrean Beja into Sudan. There are also tens of thousands of Beja in southern Egypt. The Beja are divided into a number of groups and tribes. Those Beja living in the northern region make their living raising camels and sheep, as well as producing grains on a small scale; farther south they also raise cattle. The Beja living in the Gash and Tokar deltas of the Barka River are commercial and subsistence farmers, raising cotton and grain. Most Beja are Muslims, but their indigenous, animistic traditions still have a powerful hold on the people.